Here we have the building inscription, a logo for Schwarzenbach Looms (click for detail), a modernist clock and terra cotta moths. The building is a 12-story loft building stretching along the west side of 4th Ave. (now called Park Ave. South) from 31st to 32nd Sts. It was constructed in 1912 and designed by the architects Mulliken & Moeller (Harry B. Mulliken (1872-1952) and Edgar J. Moeller (1874-1954). Harry Mulliken designed the Aberdeen Hotel just a few blocks west at 17 W. 32nd St. For more on Mulliken & Moeller see Christopher Gray's "Streetscapes" article, New York Times 14-Sep-2003. From 1912 to 1932 this was the home of the silk importers Schwarzenbach, Huber & Co. They were a Swiss firm based in Zurich, who established a branch in New York around 1888. They were located at 472 Broome St. from that date until moving uptown to this building in 1912/13. The first of three generations of Schwarzenbachs to head the business was Robert Schwarzenbach (1839-1904). He was followed by Robert J. F. Schwarzenbach (1875-1929), then by Robert J. F.'s brother, Alfred Schwarzenbach (1874/75-1940). The third Robert Schwarzenbach to be president was Robert Maximilian Schwarzenbach (1917-1988). He was Robert J. F.'s son. The Schwarzenbachs appear to have remained Swiss citizens with the exception of Robert M. Schwarzenbach who was born in Jericho, New York. Alfred Schwarzenbach's obituary in the New York Times (19 Nov. 1940, p. 23) reads in part, "Dr. Alfred Schwarzenbach ... died Sunday at his estate in Switzerland. He was 65 years old. Dr. Schwarzenbach, who was born in Zurich, was educated in schools in Zurich, Berlin, Leipzig and Paris. In 1904 he took charge of the Zurich branch of the international silk house. After the death of his brother Robert he became president of the firm, which has local offices at 498 Seventh Avenue and which sponsored many developments in the silk industry... He served for a year in the Zurich Parliament... He held the military rank of colonel and was at one time the Chief of Staff of a Swiss division." Alfred Schwarzenbach's daughter, Annemarie Schwarzenbach (1908-1942), was an author, journalist and photographer, who traveled extensively, including trips through America's south during the 1930s. More on her life can be found at the Swiss Institute website. Robert J. F. Schwarzenbach was president of the Swiss Benevolent Society of New York from 1911 to 1924. This was the organization that built the Swiss Home at 35 W. 67th St. near Columbus Ave. in 1904. The Swiss Home on W. 67th St. closed in 1995. Christopher Gray's article in the New York Times, 25 Sep. 1994, traces its history. Robert J. F. Schwarzenbach's wife was Hedwig Margaritha Frölicher (1889-1972), a Titanic survivor. She was en route to New York at the time to be married to Schwarzenbach. They married a year later (1913). Huber was Jacques Huber (1851-1918). Jacques Huber is probably the same as the John Huber who appears in the U. S. Census of 1900, living at 335 Hudson St., Hoboken, New Jersey. Huber is described there as single, born Feb. 1851, Germany, immigrated 1875, naturalized citizen, Silk Manufacturer. According to John Paul von Gueningen's The Swiss in the United States, (2005), p. 120, "The silk industry of West Hoboken was one of considerable importance. The firm of Schwarzenbach-Landis located in Thalwyl, Zurich, maintained a branch in West Hoboken, the Schwarzenbach Silk Co., an affiliate of the silk-importing firm Schwarzenbach, Huber, & Co., in New York." A short biography of Huber appears in Wikipedia (in German): born Horgen, Switzerland 1851, immigrated to US 1874, developed with Robert Schwarzenbach the international silk-dealers Schwarzenbach, Huber & Co. New York, became president of the Silk Association of America in 1902, built Villa Seerose on the lakeshore at Horgen 1902-1908. Views of the Villa Seerose can be found at Horgen Online, which also includes a short biography of Huber. Better views of the Villa can be found at Kanton Zürich. Horgen is on the west side of the Lake Zurich about 8 miles south of Zurich. Thalwil is nearby, slightly closer to Zurich. The clock is known as the Silk Clock (click for detail). It was installed in 1926. The New York Times (13 May 1926, p. 42) gives the following account: "In behalf of the Schwarzenbach enterprises, a 'Silk Clock,' made of bronze, was dedicated yesterday morning ... by Robert Schwarzenbach at 468 Fourth Avenue. The clock, which juts from the wall of the Schwarzenbach Building, was unveiled by Mr. Schwarzenbach's sons, Robert M. and Jean Christophe, before two hundred guests assembled in the street. A figure of Zoroaster, 'the mastermind and doer of all things,' is perched atop the clock. At his feet is a cocoon, and beyond sits a slave representing the 'primitive forces and instincts of man.' Every hour Zoroaster waves a wand, and the slave, rising at the will of his master, swings a hammer against the cocoon. Promptly the 'Queen of Silk' emerges from the cocoon, a tulip in her hand, and not until the hour has ceased striking does she disappear." This account continues that the makers of the clock were the Seth Thomas Clock Co. and the Kunst Art Bronze Foundry. It was designed by McKim, Mead & White, architects, and William Zorach, artist. The terra cotta moths (click for detail) that flank the clock are the work of Marguerite Thompson Zorach (1887-1968) (wife of William Zorach). Art is My Life: the Autobiography of William Zorach (1967) describes Zorach's dealings with Robert J. F. Schwarzenbach during the period 1925 to 1929. His account of the clock (p.79-80) is as follows: "He [Schwarzenbach] was Swiss and had a Swiss's love of wood carving and trick figures. He wanted a carved clock for the front of his building on Fourth Avenue with the figure of a man and a girl, 'The Spirit of Silk,' to appear on the hour. He had McKim, Mead and White design this clock for him and he hated it. Then he asked me to design it. It was a terrible ordeal. He drove me crazy fussing over these designs. That summer in Maine I had a model made full size in plywood and painted it to look like bronze, shipped it down, and hung it on his building. Schwarzenbach came down from his office, took one look, and said, 'That's not what I want,' and disappeared. I felt utterly defeated. But I went ahead and carved the little figures in wood anyway. I took them to Noské's office, and when Schwarzenbach came in he seemed rather pleased with them. He said, 'I've got to leave for South America tomorrow; so go ahead with the figures and the clock.'" 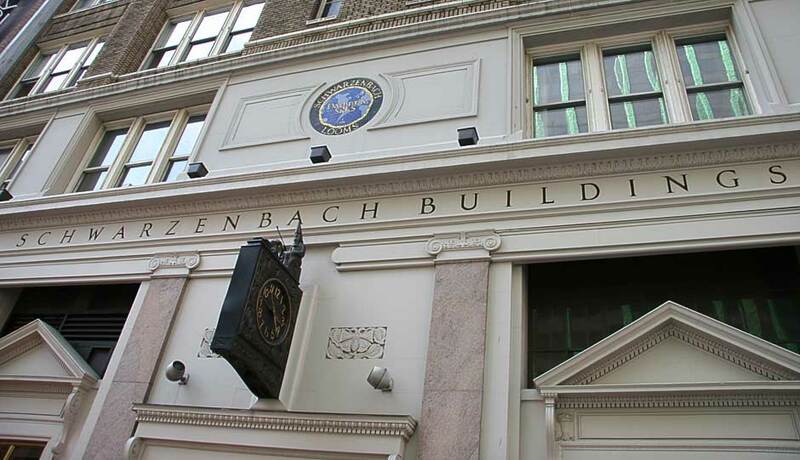 In the late 1920s Schwarzenbach, Huber & Co. opened a salesroom at 498 7th Ave. (near 37th St.). Then around 1932 they moved their primary offices to this 7th Ave. address until 1946, when they returned to 470 4th Ave. In 1974 they left 4th Ave. (Park Ave. South by that time) for good, moving uptown to 1185 6th Ave. (near 46th St.). The business closed in 1988.